In ‘A Star Is Born,’ a musician helps a young singer and actress find fame, even as age and alcoholism send his own career into a downward spiral. A Star Is Born is about an alcoholic rock star named Jackson Maine (Bradley Cooper from Silver Linings Playbook and Serena) who, after a show one night while on tour, is desperate for a drink and stumbles into a drag bar. While watching the show, he instantly becomes smitten with one of the performers, a young woman with a beautiful singing voice named Ally (pop star Lady Gaga, who has also appeared on “American Horror Story”). Jackson hangs out with Ally for the rest of the night, discovers that she’s a songwriter, and convinces her to come on tour with him. As their relationship progresses and the pair falls in love, Ally becomes a popular part of his show. Ally’s star starts eclipsing his own, and Jackson’s mixed feelings of pride and jealousy feed his inner demons. As an actor, Bradley Cooper has worked with the likes of directors David O. Russell (American Hustle, Joy), Cameron Crowe (Aloha), and Clint Eastwood (American Sniper), and he shows that he has learned well from his experiences as he makes his directorial debut here. Cooper also co-wrote the screenplay with Eric Roth (Extremely Loud & Incredibly Close) and Will Fetters (Remember Me), but the script isn’t A Star Is Born‘s strongest element. With a few key deviations, the story sticks pretty close to that of the 1976 Barbra Streisand/Kris Kristofferson version of the film, and the screenplay itself is a bit flat, particularly on the dialogue side of things (although there are a handful of chills-worthy memorable lines that make up for all of the on-the-nose fluff). Furthermore, the conflict and melodrama in the film is all thinly manufactured and contrived. But, what saves A Star Is Born, or more accurately, what makes the damn film, is both the music and the cast. More on the music later, but as far as the cast goes, Bradley Cooper brings it hard to his role as the burnt-out, drug-addicted rock and roller. Lady Gaga essentially is playing what seems to be a version of herself, which is probably why it’s difficult to imagine another actress in the role, at least in this particular telling of the story. Through his and Gaga’s performances, Bradley Cooper is able to breathe new life into an age-old stereotypical story, thereby turning a predictable, run-of-the-mill movie into one of the highlights of the year (and possibly of his career). Personally, I am not quite as enamored with A Star Is Born as many critics are. Hell, the problems that I stated earlier that I have with the script may make this the most negative review of the movie that some people will see. And that says a lot. Because despite its flaws, A Star Is Born is powerful and enjoyable. A movie like A Star Is Born has to have a smoking soundtrack for it to work, and luckily, it does. Lady Gaga and Bradley Cooper (with help from some A-list pop songwriters) wrote a good chunk of the music, and both of the stars perform their own musical stunts, too (which you would expect from Gaga, but Cooper is able to keep pace with his surprisingly tuneful voice). Jackson Maine’s music sounds like classic Neil Young, loud and grungy with hints of a softer, country-esque side. Ally’s music is more Carole King/Linda Ronstadt sounding, except for when she makes a quick grab for pop stardom and sounds like a Pink clone (or like a stripped-down Lady Gaga). 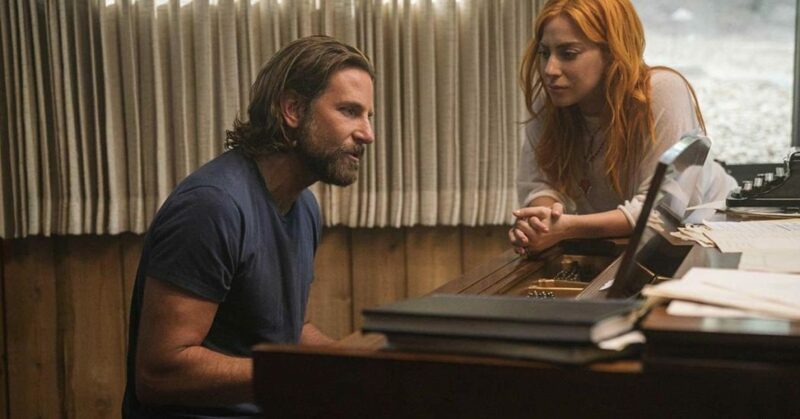 Regardless of style and genre, the songs in A Star Is Born are all hits, and it would not be shocking to see at least one of the tunes wind up nominated for Best Original Song at the Oscars (probably “Shallow,” a lovely duet which is being pumped as the lead single from the soundtrack). Bradley Cooper and Lady Gaga in ‘A Star Is Born.’ Image courtesy of Warner Bros. Pictures/Metro-Goldwyn-Mayer. But the musical experience in A Star Is Born does not stop with the actual music. The performance scenes look like they’ve been pulled from a concert movie, with huge crowds, blinding lights, and jump-cut editing. Some of the bigger concert segments were actually shot during a Lady Gaga tour stop and during the singer’s performance at the 2017 Coachella Festival. The musical number scenes are far and away the most exciting and adrenaline-fueled segments of the film, which is saying a lot, since the film itself is never short on energy and emotion.